Our growing family is getting ready to move from .19 acres to a full acre and while I’ve dreamed of the space for years, it’s hard to narrow down exactly what to do with it. If you’re trading out your backyard for a bigger space or are looking for some backyard inspiration, check out these ways you can craft a pretty amazing outdoor area. 1.Turn that awkward side yard into a putting green. This is pretty brilliant. 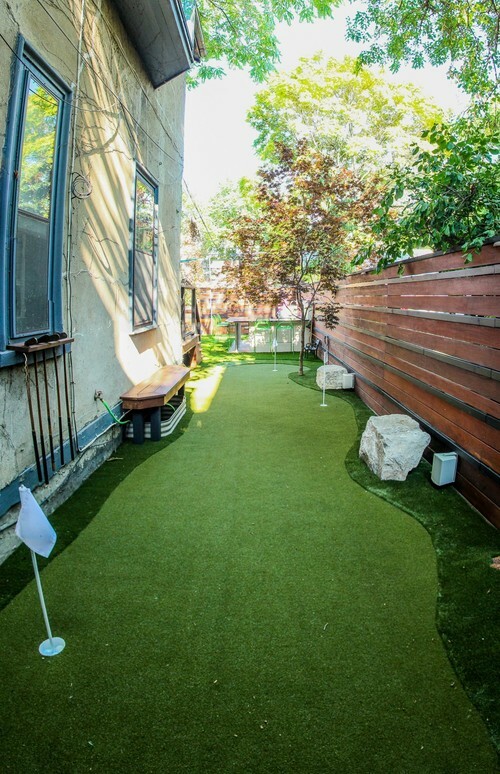 Take that small, basically useless space on the side of your house and turn it into into your very own putting green. 2. Get an epic play structure. Kids will be in heaven climbing, swinging, and sliding down your epic play structure. A fort is a must for playing pirates, house, or a million other imaginative games kids come up with. 3. Build an outdoor movie theater. Imagine the memories you could make in your own outdoor movie theater. This is an awesome backyard movie theater you can DIY. 4. Install a residential splash pad. Yes, there are companies that do this for you! A backyard splash pad can cost $2,000 to $4,000 and are much cheaper than installing a pool and safer as well. 5. Design an outdoor kitchen. If you like to entertain, make sure you save some room in your budget for an outdoor kitchen. These outdoor kitchens should give you plenty to think about and dream about. When I think of the picture-perfect backyard, there’s always a porch swing where I can lazily read a book on a summer evening. My kids would use a multi-functional sports court every singe day, rain, sun, or snow. If you’ve got space, this would make for one cool backyard! Lights are such a simple detail that make a huge difference. Stringing up some outdoor lights or garden lanterns will automatically elevate your backyard to “cool” status. If you find that the pizza delivery guy no longer uses GPS to get to your house, maybe it’s time to get your own pizza oven. How amazing would this be? Outdoor pizza ovens are pretty amazing and are just as much a conversation piece as they are functional. Turn up the party or wind down to music right on your own back porch. Set up a portable record player (yes, they’ve made a comeback!) or invest in an outdoor sound system. There are some pretty smart options nowadays. One thing most of the coolest backyards have in common is that they all have a fire pit. There are endless designs out there, and many DIY versions, but one thing’s for sure…fire pits bring the people together. If you’re going to have a cool backyard, you’ve got to have plenty of places to lounge. Whether it’s a SkyBed or one of these DIY hammocks and swings—plenty of cool lounge areas is a must. When I was a teenager, the house that had a hot tub was automatically the coolest house to hang out at. And it’s true—hot tubs are super alluring. You can actually swim laps in some hot tubs! One key to making your backyard the cool hangout spot is outdoor seating. From tables to sectionals, shop around and choose something that works for your space and that makes a statement. 15. Make a backyard zip line. Kids love this little DIY zip line that you can totally make in a Saturday afternoon. Water features can get pretty extravagant and the peaceful sound they make will definitely add to your curb appeal. Check out these creative outdoor water features that would make for an incredible back yard! Think your backyard is pretty cool? Tell us what you’ve done to get it there! The post 12 Brilliant Ways To Make Your Backyard the Coolest appeared first on How Does She.